Support your ideas with statistics! Are you writing a paper? Giving a speech? Be more persuasive and support your ideas with statistics! 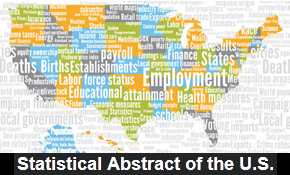 Formerly a print volume that was released yearly, the Statistical Abstract of the United States is now a searchable online database. It contains a huge number of facts and figures about life in the United States, from poverty to employment to education to marital status. Learn how many people applied to purchase a firearm from a Federal Firearms Licensee in 2010 (10,405,000), how many children were living below the poverty level in 2011 (15,539,000, or 21.4% of all children in the United States), how many librarians were employed by academic libraries in 2010 (26,706), or what percentage of women married between 1960 and 1964 reached their 40th anniversary by 2009 (49.7%). Data is presented in tables, and each can be downloaded as an Excel file or a pdf.